The Great Depression of the 1930s forced mountain people to “make do” with what they had or create substitutes for what they didn’t have. Store tokens were good examples. Cash was scarce because so many banks had failed, so people hoarded whatever money came into their hands. To stay in business, local stores made their own money in the form of paper scrip or metal tokens. 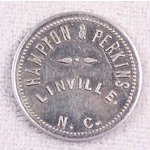 Here’s an aluminum token issued by Hampton & Perkins of Linville, NC. (a store established by a distant cousin of mine). When a farmer sold his produce to the store, he got paid in store money like this, which he could then use to buy other merchandise. The Linville community was so tightly knit that their make-do monetary system worked quite well. In some mountain villages, this commerce in homemade money continued until World War II. These tokens are now collectors’ items. Hampton & Perkins still operates at 77 Ruffin Street in Linville as the Old Hampton Store, a tourist attraction that sells some of the best barbeque sandwiches you’ll find anywhere. And you can buy them with regular US greenbacks.